For many years I’ve wrestled with how to handle my absences from school– but generally, I have two options for my elementary and middle school students: 1) cancel classes or 2) have an adult who is not normally with the students/not a Spanish teacher supervise class time. My struggle with this stemmed, essentially, from the fact that I was focusing on discrete grammar and vocabulary, which provided little flexibility in what a substitute could do with the students–the children were very reliant on me for their learning. 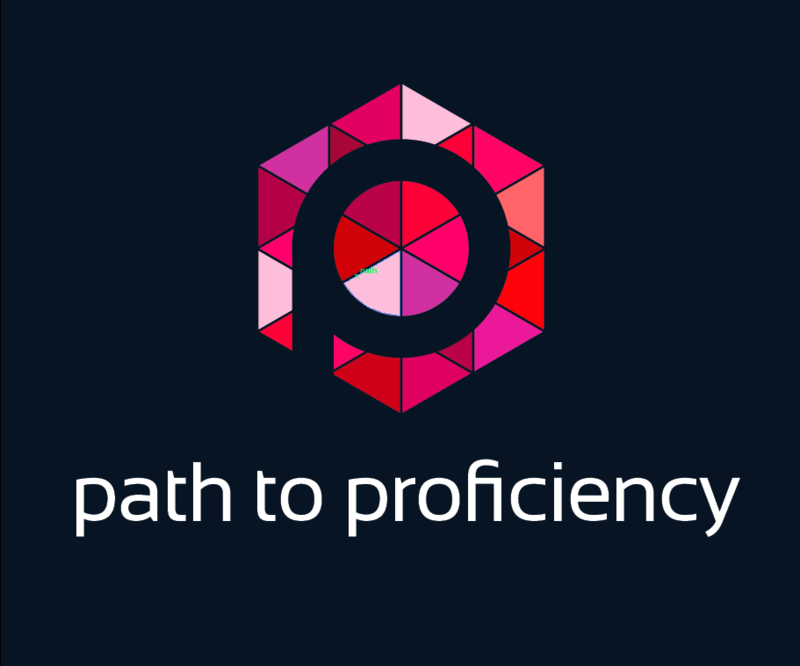 This week, I had to call in sick for the first time this year, and quickly found how shifting to teaching for proficiency has changed how my absent days look. My upper elementary students met with my teaching assistant who facilitated independent activities: FV (free and voluntary reading), choice work(fast finishers) and playing Verba. This fall, I started with FVR in class– the students love it and are in the routine of independently choosing books and articles that are a ‘good fit’ for them. 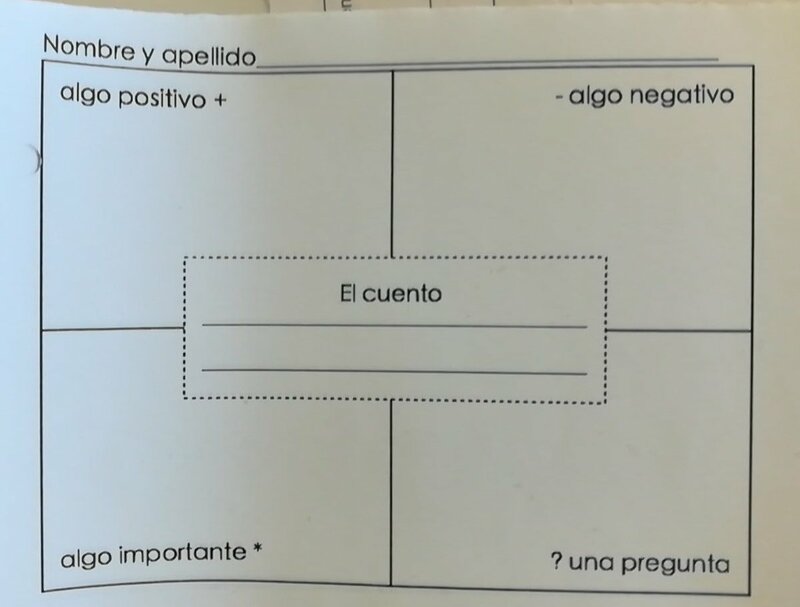 I was inspired by Martina Bex and her laminated fast finishers that focus on language in context that can be completed with a dry erase marker and self-checked, when applicable. I’ve been compiling the work from a variety of sources, including Mad Libs in Spanish. Like the books available for FVR, levels from novice low to my heritage speakers are represented in the choice work and the children decide what feels like a ‘good fit’ for them. They can seek the help of another student if or when they need.Finally, the children can play Verba. I have five sets of this game, which is alike to Apples to Apples(available in Spanish, French, Latin, English, Chinese, Japanese). The Pericles Group has generously made this game available for free if you’re willing to do some laminating and cutting. 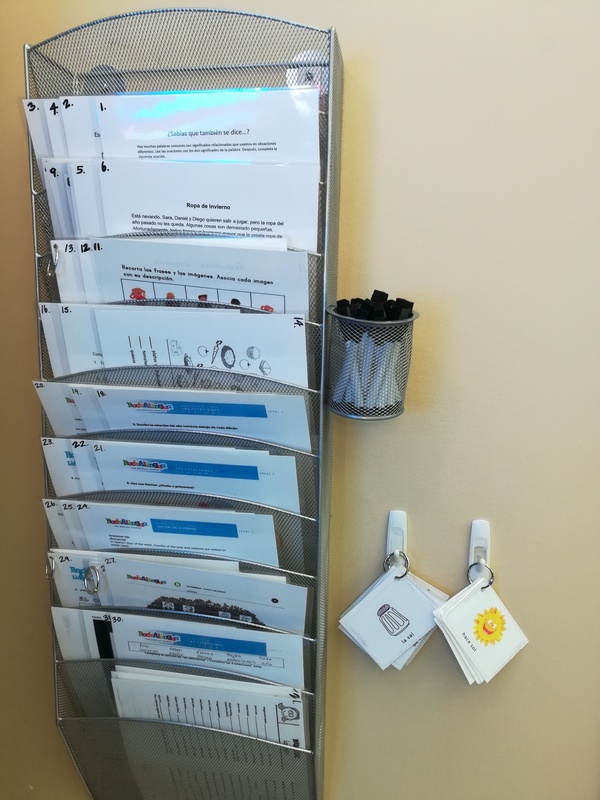 And for the future, once they’ve got a lesson on it, the children will be able to use our Chromebooks to play games on our Rockalingua subscription, and hopefully, work on Flipgrid and other tools. In middle school, the work for the students was equally choice-rich. I emailed the 7th and 8th graders to let them know I’d be out and they could choose to spend their class time(supervised by a middle school teacher) on the following: 1) working on Duolingo 2) listening to and completing a curated list of activities on Spanishlistening.org 3) listening to the current podcast on https://www.newsinslowspanish.com/latino/ and either write a summary or fill out a from (from Martina Bex) to prepare for a conversation with a partner (then have the conversation) 4) Read one of the articles from our “Mundo en tus manos” news subscription and fill out the same form to have a conversation with a friend, and then 5) play Verba in a small group. All of these activities rely on self-selection, independence and a focus on language proficiency over discrete vocabulary and grammar. They offer an opportunity for review and/or exploration of new language based on student choice. Most importantly, they are in response to feedback the students gave me in: they value and want choices in their learning. Arriving at this place, in which I’m still evolving, learning and developing, was a long time in the making. I’ve had to let go of some of my old ideas about how the children learn language and their role in their process. In letting go of some of those old ideas and practices, I’ve embraced trust–trust in both the process of language acquisition and in the children themselves.